Sometimes I write letters to fictional characters. One day they will reply. 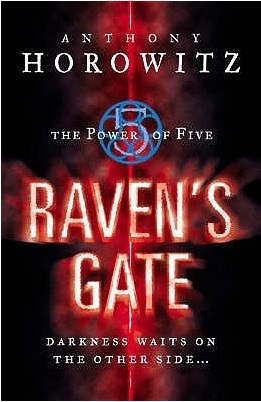 Raven’s Gate (The Power of Five #1) by Anthony Horowitz. Have you ever seen Hot Fuzz? Oh, sorry. No, don’t worry, you haven’t signed up for SIMON PEGG SUPERFANS* or anything. It’s just that I’ve just finished reading Raven’s Gate, you know… that biography that Anthony Horowitz wrote about you when you were fourteen? After you’d just got yourself into a bit of a pickle and you had to go to THE DREADED NORTH as a punishment? I know you’re like ridiculously famous and you’re probably really busy saving the world from demons and basically being awesome but I just thought I’d send you a quick note to say how much I enjoyed your book. And well, I wanted to tell you it reminded me of Hot Fuzz. Also The League of Gentlemen a little bit, but that’s mostly because of the creepy Northerners aspect of things**. I have to say, first up, that you have to deal with a lot of mental stuff. I mean, when I was fourteen the height of excitement was bowling followed by a meal out a Pizza Hut (part of that thrill was the naughtiness of sharing one bowl of ice cream at the Ice Cream Factory with my two siblings without the people who worked there noticings. Though, to be fair, I mostly just had a bowl of toppings) but you? You have to deal with your… *cough* quirk… I’m trying to not say anything just in case those people from Nexus go through your drawers and read it. I’m not being funny Matt, but people who know about you and your…. quirk… well they don’t have a long shelf-life do they? Just saving my bacon. Any other boy would have at least five chapters of moaning and whinging and I’ve not even mentioned the evil dogs from hell and the face melting shenanigans! But I guess Mr Horowitz might have a bit of artistic license in that respect, right? If not and that’s completely how you acted when your life went from horrible to even worse than I have a lot of respect for you. But if Mr H did skip over that chapter where you climbed under the covers and had a bit of a paddy then maybe you could thank him for me? Are you still in touch? It must be pretty brilliant to be the star of your own adventure. I won’t lie, if I was going to save the world, which thankfully I have not been asked to***, I think I’d want better baddies. I mean, they were OK and yeah they were pretty evil but they were a bit predictable. And Mrs Deverill… well, I’m kind of sceptical. Can a person who appreciates the value of a well-placed brooch be truly evil? Also, I can imagine her wearing tweed. Tweed doesn’t scream EVIL does it? Actually… no, I retract that statement. Tweed is terribly evil. Also terrible. But I guess, at the end of the day, if you’re going to be lumbered with an adversary you would want them to be predictable so you can, well, predict what they do so you can always be one step ahead of them and their dastardly, homicidal deeds. But do you see it from my perspective, as a reader? Of course you don’t… because you’re just happy to be alive. I’m still intrigued though because, and don’t spoil this for me because I’ll be picking up Volume Two soon, I think they are just the first piece in the puzzle… and they’ll fit together to form an big, evil picture. Am I right? No. Don’t tell me. Anyway, I have to go because I have a flight to Peru booked. Um… actually, no I don’t. I’m definitely not going to Peru. What? Oh I was just stretching my legs. I wasn’t kicking my passport out of your eye sight. Nope. Ps. Tell Richard if he’s still unemployed I can offer him a role as a co-blogger. I couldn’t pay him or anything but he could write and read whatever he wants to and I would treat him to a take-away every Friday. Um…every other Friday. Also… completely unrelated… is he still single? Pps. Sorry, I didn’t even wait for your answer… have you seen Hot Fuzz? It’s great but not as brilliant as Shaun of the Deador as mind-blowing genius as Spaced but it’s approximately a billion times funnier than Paul. Actually, I’m just going to go ahead and sign you up for SIMON PEGG SUPERFANS****. *Free packet of Jaffa Cakes with every member. ** Which was filmed a few miles away from me. I’m not a creepy Northerner though…. Ish. ****Potential free packet of Jaffa Cakes with every member. Unless scoffed by moi. I really do love Jaffa Cakes. Jo, you’ve managed to get references to Hot Fuzz, The League of Gentlemen, Spaced AND The Ice Cream Factory in one post.